We all came in expecting a rainy day with inside projects (of which there are many) but were rewarded with a nice, cool day with some sun and clouds. The gardens are literally springing to life with plenty of color in evidence. 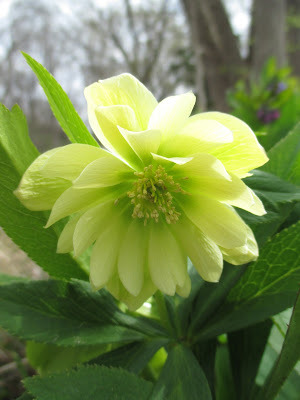 Above is the ‘Golden Lotus’ double hellebore (Helleborus sp.) which is always enchanting in the woodland walk garden. Below are many other shots of plants out in the gardens. We had a busy day of hustle and bustle around the gardens as we continue to mulch, weed, tidy, plant and ultimately prepare for a very busy spring (which is already here!). We had some rain overnight but not enough to make it too sloppy. Progress continued on the giant Aquarium which continues to look quite awesome (photo further down). Plant deliveries continue to arrive and we are processing orders as they come in almost daily. We had plenty of awesome volunteers around and our grounds staff continues to be pretty awesome as well. We’ve also had some very generous donations to the grounds department which is most appreciated. Our volunteers accomplished a wide range of activities today. Kay (above) tidied along the west road near the Parker Education Center and did an excellent job cleaning up this space which needed a lot of varied and intense TLC! It’s looking great and Kay is “expanding her range” later in the week in that same area. Directly below are Eva (left) and Kathy who spent a second day in the Japanese garden collecting debris and making everything look nice. That garden requires the most care “per square foot” I would say, so we do have lots of focus on making it look nice. The second photo down shows (left to right) Gena, Myrt and Nancy. The ladies pulled a whole lot of thistle today near the Nancy Yahr Memorial Children’s Garden and helped weed some adjacent areas. Bob, Bev and Deb were excellent today in leading the charge to divide another big load of daylilies. Along with help from two industrious RECAPPERS, these five accomplished a lot of work and continued well in to afternoon with additional tasks including rototilling. Janice had her Chestnut House volunteers on hand for a tour and some gardening as well. There are a few new volunteers in this group for 2016 so the orientation is important. We also saw Maury (errands), Bill O. (odds and ends) and many others today. The grounds staff kept busy today with Cindy planting pansies, tidying, weeding and accomplishing many other tasks and duties. Larry H. continues to be “mulch boy” but also did some edging as well. Terry and Big John hauled more Hummingbird Garden Art Projects to Utzig Carstar in Janesville (the sponsor of this event) for seal coating. The project that have been returned are unbelievable and we look forward to putting them out in the gardens this spring (auction is in September for these unique art pieces). The guys also placed and filled many more containers, moved our giant chairs and are preparing the yard for the upcoming Spring Plant Sale (see our website for details). Janice worked with volunteers, prepared more information for our Heirloom Garden and processed a lot of labels for our daylily division sale which will be held in conjunction with the Golden Kiwanis Tree Sale on April 29th and 30th (8 am – 4 pm) at the Horticulture Center. We’ll also be selling pansies and compost on both of those days. Daylily divisions will be $5 each or $4 each for 5 or more….! I keep treading water with daily tasks, preparations and catching up on some items. We are definitely in the busy season.